Responses to the question “Before this survey, were you aware of the concept of a science shop?” by stakeholder group. Number of respondents: researchers=334; community organisations=78; policy makers=85; other=96. Over 600 individuals from 34 countries responded to a web-based survey, conducted by SciShops to shed light on the awareness, experience and opinion about community-based participatory research in general, and science shops in particular. Respondents included community organisations, researchers and policy makers. The results show that most of the respondents (62 percent) were not familiar with the science shop concept. Only a third had heard about science shops before the survey. 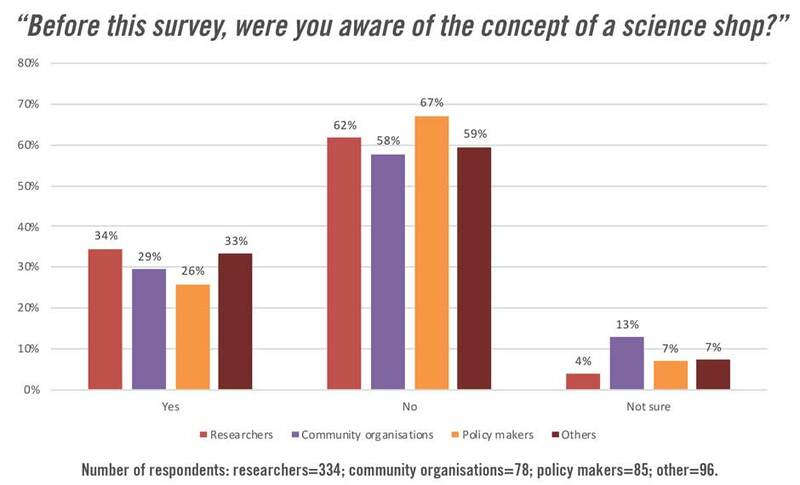 Awareness was slightly higher among researchers than community organisations and policy makers. Among researchers, awareness of the science shop concept is higher in social sciences and humanities than in natural sciences, technology and formal sciences. There are also prominent geographical differences, with awareness of the science shop concept in Western Europe at 67 percent, compared to Eastern (34 percent), Southern (37 percent) and Northern Europe (24 percent). ”The survey shows that there is great potential for spreading the concept of science shops and community-based research. It clearly indicates that the work being undertaken in the SciShops project, which is aimed at creating new science shops all over Europe and strengthening the science shop ecosystem, is very important to reach a broader audience,” said Martin Bergman, a researcher at VA (Public & Science), who managed the survey. For more information about the SciShops project in Sweden contact Martin Bergman or Helen Garrison at VA.